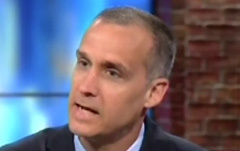 CNN political commentator and former Donald Trump campaign manager Corey Lewandowski lied about Newsweek’s Kurt Eichenwald, claiming the reporter, who authored a report explaining how Republican presidential nominee Donald Trump’s business ties would cause a “national security nightmare,” has “said that he has information that George W. Bush was directly related to the 9/11 terrorist attack.” CNN host Alisyn Camerota corrected Lewandowski, noting that Eichenwald actually “said that George Bush ignored warnings before 9/11” and not that the former president was involved in the attacks. ALISYN CAMEROTA (CO-HOST): Corey, One of the things that Christine is referring to is this Newsweek investigative piece about all the entanglements -- the foreign entanglements with countries like Saudi Arabia, the UAE, Russia, Ukraine -- that the Trump Organization and [Trump] Foundation are entangled with. If Donald Trump becomes president, would he and his family step away from the Trump Organization that they have built because of those entanglements? LEWANDOWSKI: He said his children are going to run his business, and that's been very clear from day one. CAMEROTA: Even though it would be compromised if he’s the president? CAMEROTA: So you deny this whole -- so you dismiss what he's found in terms of the connection between the Trump Organization and all of these foreign entanglements? LEWANDOWSKI: Look, if this author of Newsweek has direct information that George W. Bush was directly related to 9/11, produce that information. QUINN: But what about this story? LEWANDOWSKI: That's what he has claimed. He has zero credibility. No, it is a point of credibility. He has said that George W. Bush was directly involved with 9/11. LEWANDOWSKI: He has zero credibility. No, no. It is a point of credibility. QUINN: We don't actually know all of the business entanglements. We don't know how to judge what's there or not. I can't tell you the comparison of the facts that are public about the Newsweek story because not all the business dealings have been made public. He’s not transparent. CAMEROTA: But very quickly, I just want to clarify something. Kurt Eichenwald, I'm being told by my producers, said that George Bush ignored warnings before 9/11. CAMEROTA: Not that he was involved, that he ignored warnings. Newsweek's Kurt Eichenwald Explains How Trump’s Business Entanglements Would Cause A "National Security Nightmare"
Tell CNN it's time to end the worst conflict-of-interest problem in the history of cable news.